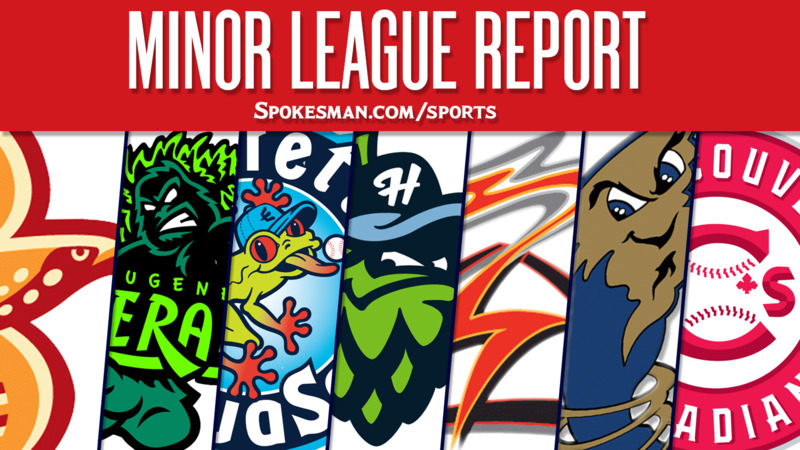 Spokane 8, Eugene 7: Hasuan Viera drew a bases loaded walk to force in a run in the eighth inning and the Indians (9-17) came back from a 7-1 deficit to edge the visiting Emeralds (9-17). Starling Joseph cranked a three-run homer (2) in the seventh to tie it at 7-7 and J.P. Martinez added a two-run shot in the sixth. Boise 6, Vancouver 5: Terrin Vavra hit a walk-off grand slam and the Hawks (15-11) topped the visiting Canadians (13-13). Vavra finished 3 for 5 with six RBIs. Hillsboro 11, Tri-City 0: Joey Rose hit a two-run homer and the Hops (18-8) routed the visiting Dust Devils (13-13). Rose went 2 for 5 with three RBIs and Jose Caballero added a solo home run for Hillsboro. Ryan Dobson sent 4 for 5 with four runs. Everett 7, Salem-Keizer 4: Josh Stowers went 3 for 4 with a two-run home run and the AquaSox (13-13) beat the visiting Volcanoes (14-12). Connor Hoover added a solo homer for Everett. Round Rock (AAA): Off for Triple-A All-Star Game. Frisco (AA) 4, San Antonio 3: Ariel Jurado gave up two unearned runs over 7.1 innings and the RoughRiders (35-54) edged the visiting Missions (52-36). Preston Beck went 2 for 4 with a solo home run (11) for Frisco. Buies Creek 3, Down East (High-A) 1: Patrick Sandoval struck out eight over seven one-hit innings and the Astros (51-39) topped the visiting Wood Ducks (44-47). Walker Weickel allowed four hits and a walk over five shutout innings for Down East. Hickory (Low-A) 9, West Virginia 3: Bubba Thompson went 2 for 5 with a three-run home run (4) and the Crawdads (40-47) handled the visiting Power (47-38). Tyreque Reed went 3 for 4 and drove in a run for Hickory while Preston Scott added three hits. Published: July 13, 2018, 5:55 a.m.